Aston Martin's new sub-Valkyrie superhero could also raid Nordic mythology for its name. Aston Martin CEO Andy Palmer has hinted that the next Aston Martin hypercar, shown in concept form at the Geneva Motor Show last week, could be called "Valhalla." 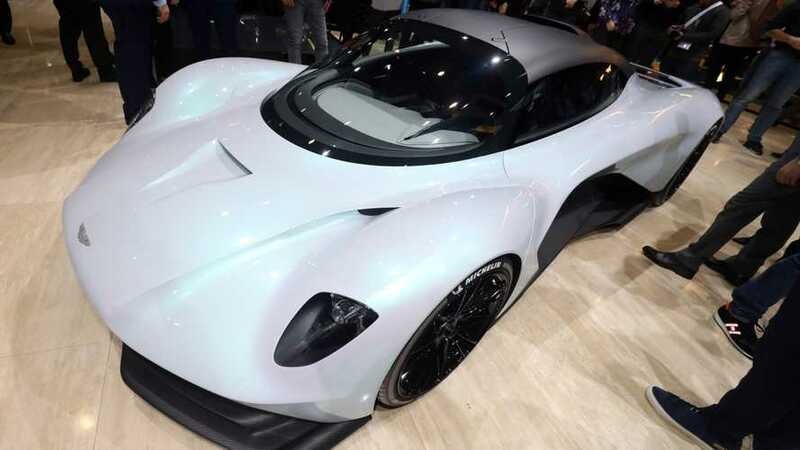 The moniker would fit in well with Aston Martin's current naming scheme, which includes halo hypercar Valkyrie and the mid-engined Vanquish, which was also shown in concept form at Geneva. According to Automotive News Europe, the car would slot in between those two models, as a hypercar below the Valkyrie but above the mid-engined Vanquish. It's set to bow in 2021, and will use the new turbo V6 hybrid powertrain developed by Aston Martin. It will be the first car in their lineup to make use of the new technology. The new car is being built as a rival to cars like the McLaren Senna and the LaFerrari's upcoming, hotly anticipated successor. Production will be limited to just 500 cars, and will be priced around $1.3 million. While the Valhalla name hasn't been confirmed, Palmer stated that "Valhalla is a name we have registered in our naming book," in a statement to Automotive News Europe. In Norse mythology, "Valhalla" is a majestic hall where the souls of slain warriors spend the afterlife at Odin's side, if so chosen by the valkyries. Speaking of the valkyries, this new car, like the Aston Martin Valkyrie, was developed in concert with Red Bull Advanced Technologies. As before, weight savings is everything. In lieu of a touchscreen infotainment screen, Valhalla owners will find a cubby to place their phones into. In Palmer's words, "In those kind of cars, you are trying to out to take weight out where you can. You have already got the smartphone in your pocket." Now that's some serious dedication to weight savings.